In an effort to provide support to women in STEM by increasing their visibility, UW’s EPSCoR will sponsor the Own It! Awards. Nominations now are being accepted for women who make a difference in the fields of science, technology, engineering and mathematics (STEM). In an effort to provide support to women in STEM by increasing their visibility, the University of Wyoming’s EPSCoR (Experimental Program to Stimulate Competitive Research) will sponsor the “Own It! Awards.” The honors will be doled out to female staff, students, faculty and a community member, all of whom have made contributions to their STEM disciplines. The community award is new in 2018 and designed to honor contributions of women in Laramie. • Is deserving of celebration. 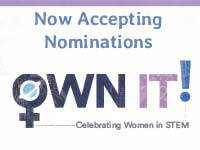 Nominations may be submitted by 5 p.m. March 23 via the Own It! website. All nominees will be recognized at the awards ceremony on April 4. For more information, contact Emily Vercoe at 766-4275 or evercoe@uwyo.edu.